And now, for something different. As any reader of my postings here knows, I love Forrest Lawn Cemetery in Buffalo, NY. Over 269 acres, Forrest Lawn stands in the heart of my city, a Frederick Law Olmstead designed park begun in the late 1800s. I try to get back there as often as I can, taking my camera through the sprawling hills, towering monuments and simple stones. But now there is life springing up amid the graves. 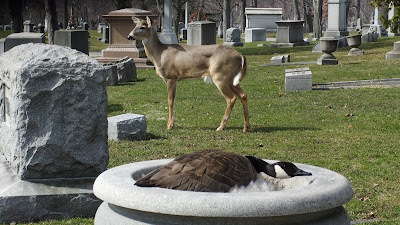 A mother goose has laid her eggs in an urn somewhere within the cemetery, and one of the deer who also live in the cemetery has befriended her, and stands guard while the mother lays on and guards her eggs. It's quite the beautiful sight, and I'd love to see them in person-- but although I can tell where within the cemetery this unorthodox couple is residing, I do not wish to disturb them. Below, you can view their 24 hour webcam of the deer and goose. 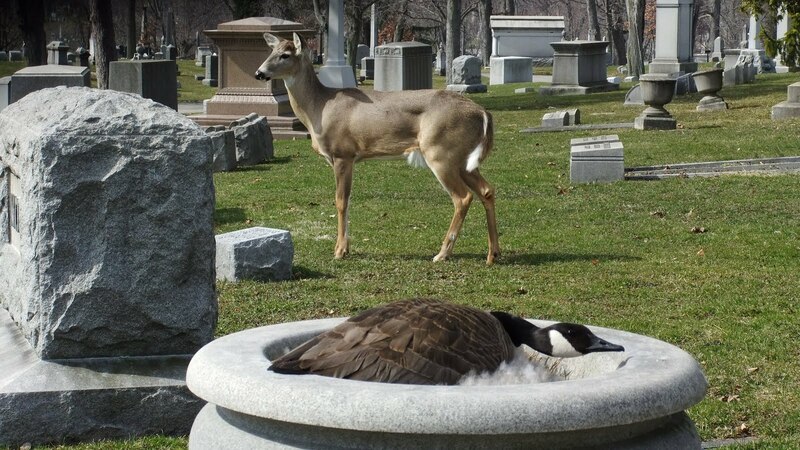 While I love the tale of these two animals, a view inside the cemetery at night is something I consider rather priceless. And worth watching well into the night.